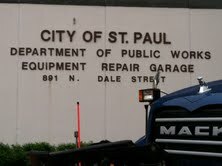 Editor’s note: When I heard that Saint Paul Public Works was having an opening house, I really wanted to go. Unfortunately, I was still in California at the time. Instead, I convinced my mom, Beth Beaty, to go and report back. She generously agreed to write about it for this blog, giving a nice citizen’s perspective on Public Works as a whole. That was my reaction when the City of Saint Paul’s Public Works Department invited me to “come join the fun!” at their open house via my Twitter feed. In fact, that question is exactly what I asked my daughter Veronica and my boyfriend Aaron when I sent them a copy of the tweet with my snarky commentary. Fun for all ages? How absurd. It was bound to be lame, right? Ooo, look at me . 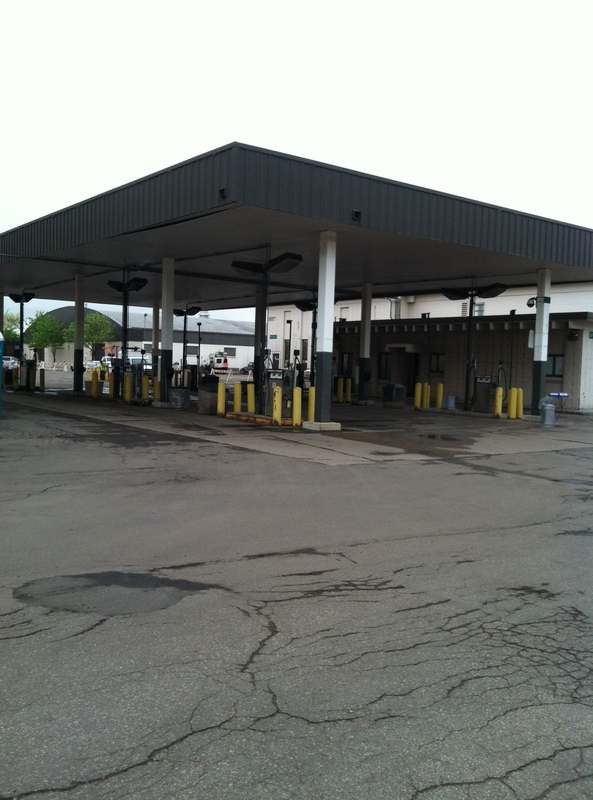 . . I’m such a loser I’m going to the Public Works Equipment Repair Garage for a good time. Doesn’t that sign just scream “fun”? However, Veronica (a former Public Works employee) and Aaron (a current City Administrator) thought it sounded great. Some quirk of the fates gave me two policy geeks to love and cherish. I am not a policy geek. I have resigned myself to spend every major holiday meal for the rest of my life asking “What exactly is it you do again?” The only reason I follow the Saint Paul Public Works department is to get Snow Emergency updates. So at their urging, and in the hopes I would learn more about their policy geek world, I set off to the open house. Besides, it was on my way home from work. 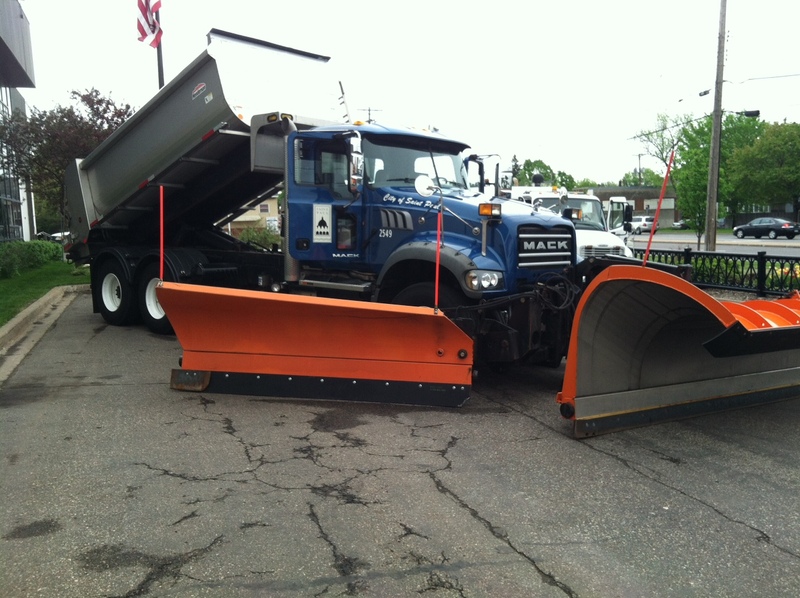 A snow plow end with not one but two blades for pushing snow and a dump truck end where salt comes out to melt whatever is left. the science fair style setup of poster boards on beer pong tables. But mostly because that garage is also where the cool stuff is, because as nice it was to be welcomed by blinking portable signage, we were all really there for the Big Trucks. At the entrance, I got the obligatory plastic bag to fill with free stuff and a map of the event. I was eager to see Fuel Island on the map, but it turned out to not be as exciting as Fire Island. As I suspected, most of the hands-on activities, at least the really cool ones, were for the kids. Little ones could be seen taking a ride up in the air in a cherry picker, repeatedly beeping the horn in a street sweeper, pretending to plow snow in a toy city, and playing in the bouncy house. No one invited me to do these things. It was a great event for kids. I could easily imagine making a huge deal out of going with a much younger Veronica. I was expecting to feel a bit out of place being there without a little one. But I didn’t. In fact, about half the adults there were without kids. And there was stuff for us, too. A nice woman explained to me that the smooth cylinder of stone was, in fact, a core sample of concrete. After she explained how they test concrete for strength, she admitted that, yes it could maybe also be an art project. I saw the cool go-over-the-side-of-the-bridge machine they use to paint and clean bridges. They had timelines for various projects around town. There was a photo display of how to tell if the thing in your yard was a broken sewer main or a Hellmouth (at least I think that’s what they were trying to teach me). If you were stranded on a fuel island, what you bring? I also had a fascinating conversation with a couple of guys who worked in the severs and heard an exciting story about taking a five minute ride down into the sewers to shovel human waste while rats ran up their arms. Organizations that partner with the city were also there offering energy audit, rain garden, watershed and street recycling information. Most of it was pretty standard to a State Fair junkie like me, but the Better Block Project caught my attention. This summer, a block along a street in town will be transformed into a well-designed, multi-use urban area. I may have added another policy geek date to my summer schedule. The work of running a city well seems not so different from jobs I am more familiar with, say, editing a book, running a church office or lighting a stage. No one sees what you do – or even thinks of what you do as a thing people do – as long as you are doing it well. I firmly believe we should all take a moment every so often to notice the work that happens behind the scenes to make where and how we live better. In that light, I was the perfect audience for the open house. All the adults were. Maybe the bucket rides and the street sweepers where just ploys to draw families in and keep the kids busy while the adults got ask dumb questions. And look into the eyes of the people who make their lives better.